We also noticed that people in this community very self-focused. While this worked great for highly self-motivated people, it was not as helpful for people who needed the community support to achieve their health goals. Our final prototype aims to tap into this community and provide them with an artifact that more clearly binds them, while also providing a layer of team-based motivation in addition to the self-motivation. What is your routine like once you enter the building? What is your routine after your workout? What is the difference between going to the gym and working out at home? What kind of behavior do you like / expect at the gym? What kind of behavior do you hate to see at the gym? How do you interact with other people in the gym? Who do they consider/not consider a part of that community? Are there any guidelines / etiquette for people? How do newbies learn these guidelines / etiquette? What is the mission / values of this community? What are the community’s goals? What are the community members’ individual goals? Do they clash? "Haven't done weights because that's scary AF because it is filled with a room with sweaty met, and it's the one group you feel most vulnerable in." "Click in, wondering what the hell I'm going to do with my stuff... Sense of uncertainty, there is definitely a system going on and I don't know. I want to be there but you feel like there are a lot of eyes on you." "Today I went to the gym at a different time than I usually go to, there are certain people that you go to at a different time but you go at a different way. You don't even know the same but it was so weird going to the gym without the same people there... I couldn't get into my workout and I think it depends on what time you go. It is like I know who is there, I don't have to worry about who is around me. I don't know if it's intimidation - I don't feel intimidated, but I think it's just comfort because you know they always go." "I had this interaction where I saw a guy that I normally see but at a different time, and I said, hey how are you, and he said, I'm good because I'm here. And I thought this was some unspoken thing about how I love the gym and this is my space." "I'm not there to talk, it's just awkward. You want to make small talk, but it has to end after hi, how are you." "There is not much direct contact with other people in the gym but there is mutual respect that exists between people." "The basic guideline of the community is to work out hard and not disturb other people." "I don't interact with other people. Gym is not really a place to hang out with other people. Working out is to be done alone." Through the interviews, we found out that the members of the weightlifting community lack direct interaction and have weak ties, but do recognize others who work out at similar times. They are also more individualistic and self-focused and more competitive compared to other communities of RSF. 1. It should create a stronger sense of community. 2. We did not want it to be obstruct / hinder their workouts. 3. We wanted to retain the competitive environment. We wanted to bring together individuals who use the same machine at similar times by placing them in teams. We also intended to create a sense of belonging and stronger connection between team members through competition with other teams. Project REPresent is a visualization of how many reps has been done within certain time period. It has a video-game theme to encourage casual competition and is easily portable with a handle and magnets to not interrupt workouts. It consists of an arduino, digital RGB Led strips, IR interrupt sensor, and four AA batteries as a power source. Project REPresent was successful in creating a stronger sense of community by encouraging healthy competition between ingroup vs. outgroup while also visually reinforcing the competitive atmosphere of the weight room. Its customizability and portability allowed the project to be placed without obstructing anyone's workout. Through several demos and interviews, we found few points that could be improved for future iteration of the project. Levels abstraction needs further research and could possible take the weights into account. Most people suggested adding individual counts to provide immediate motivation and also making the project visible to the user while they are working out. 1. Get an Arduino, 1m of RGB Led strip, IR interrupt sensor, four AA batteries and a cage, string, and one 32x18 acrylic sheet. 2. 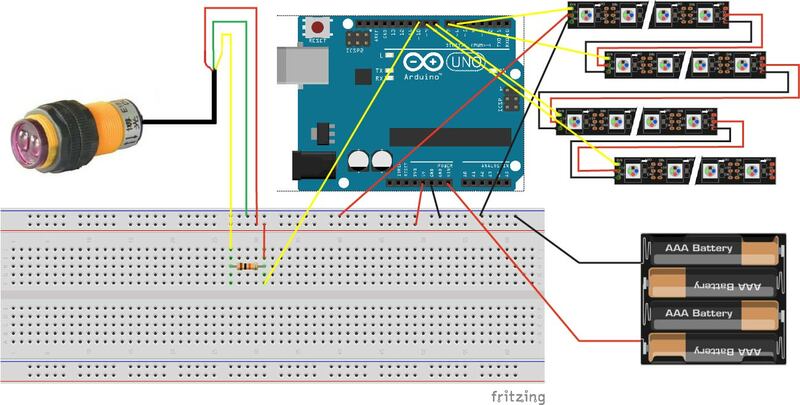 Connect all parts and upload the Arduino project. 3. Cut the acrylic sheet and make one box for the led strips and another for the sensor. 4. Cut the RGB led strip into four pieces - 0.25m each. 5. Put all parts in the boxes and tape led strips on the back of the front panel. 6. Close the box and put the batteries in. 7. Work out and compete! // This code is for the REPresent project. This is not production ready, but only meant for the demo purposes. // 3. Scale the teamTotals to the LED strips. //#define TIME_OUTPUT  13 // for LED to show whether time is synced or not. //  find if IR signal was interrupted. If interrupted, it is a REP.